Own Gandolf the Grey's pipe staff! Exactingly detailed prop replica from the The Lord of the Rings films. Includes a replica of the wizard's pipe, complete with tamper and leather tobacco pouch. 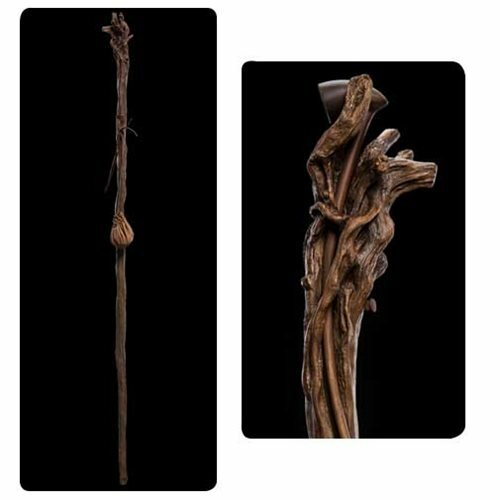 The Lord of the Rings Pipe Staff of Gandalf the Grey 1:1 Scale Prop Replica is an exactingly detailed reproduction of the staff seen in the The Lord of the Rings films. 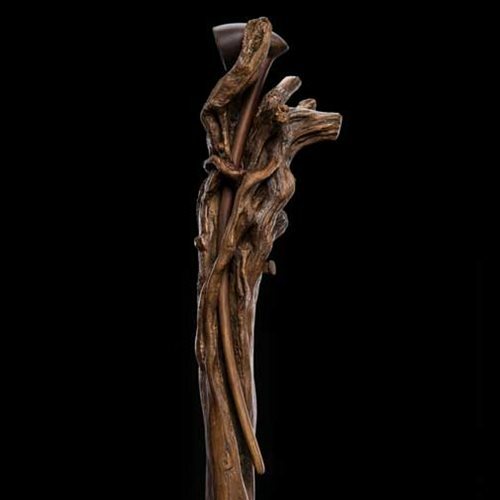 Crafted from polyresin, it measures roughly 70-inches tall x 4-inches wide x 3 1/2-inches deep and includes a removable full-scale, non-functional replica of Gandalf's long-stemmed pipe, complete with tamper and leather tobacco pouch. 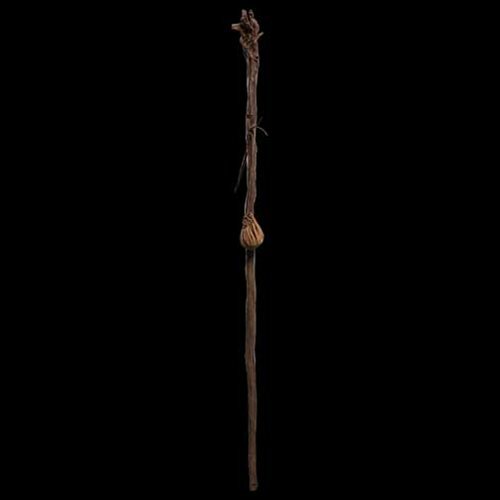 Weather-beaten and worked by years of faithful service as both walking stick and wand, Gandalf the Grey's staff was a twisted, sinewy rod whittled from an upturned sapling. Though it bore his carved initials and its stem was worn smooth by long years held in the wizard's grip, the wooden weapon did not always belong to him. 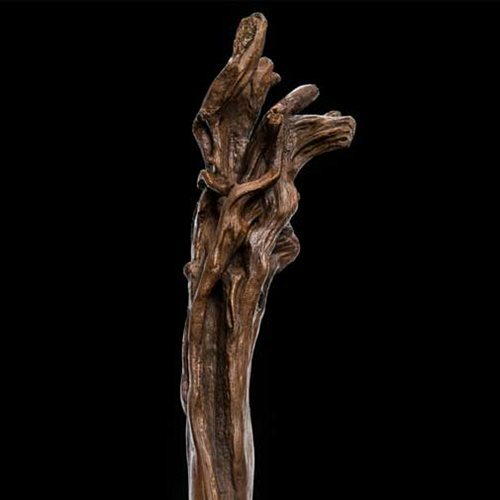 Once upon a time, it had been the staff of Gandalf's friend Radagast, the Brown Wizard of Rhosgobel, who entrusted it to his Grey colleague's care in recognition of his greater need - Gandalf having lost his own staff in Dol Guldur. By the time Gandalf came to Bag End to council Frodo concerning the One Ring, the staff clutched the wizard's pipe in a crown of snapped roots where once a crystal had nested, and from its shaft hung a pouch of the Shire-grown pipeweed of which Gandalf had become so fond. Long had it served Gandalf since given to him by Radagast, but in a strange twist it was another wizard who would take it away. When Gandalf rode to Isengard seeking the wisdom of the head of his Order, Saruman the White instead betrayed his former friend and imprisoned him, taking the staff to deprive him of its potency. Please note: Pipe stand not included. This is a non-functional prop replica and cannot be used for smoking.